I had a night the other night where I didn’t have a dinner plan in my mind, so I headed to the pantry. 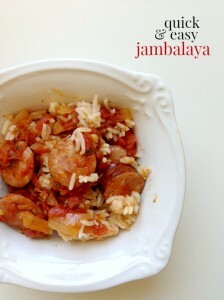 I knew I had sausage and rice, so after looking around for ingredients that would complement those, I decided to make a quick and easy jambalaya. 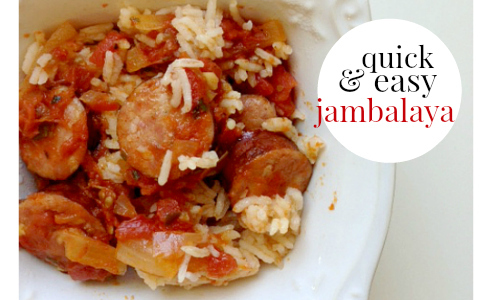 It should be said that this is not really a traditional jambalaya; there is no seafood or chicken and it doesn’t start with the complete foundational onions, celery, and bell peppers. With that being said, this recipe is still pretty yummy and you can add pretty much any additional ingredients you’d like. In a skillet over medium heat, brown the sausage pieces on both sides (about 7-10 minutes total). Transfer to a plate, leaving the oils in the pan, and set aside. Add the onion to the pan and cook for 2 minutes. Add the garlic and cook for an additional minute. Add the paprika, cayenne pepper, oregano, and salt and pepper and cook for a couple more minutes. Add the tomatoes & diced green chiles and chicken stock, reduce heat to medium-low, and let simmer for 20 minutes or until the vegetables are soft and the mixture is reduced and smelling nicely. Add the sausage back to the tomato mixture and let simmer an additional 5 minutes. At this point, you can either stir the rice into the tomato mixture or add rice to bowls and ladle the tomato mixture on top. Serve hot.